In October 1881, John McKechnie sold this property to building contractors Thomas and Michael Kelly. The following year, Michael Kelly began building a home for himself on it. The two-storey, 20 foot by 30 foot building was completed at a cost of $2,200. 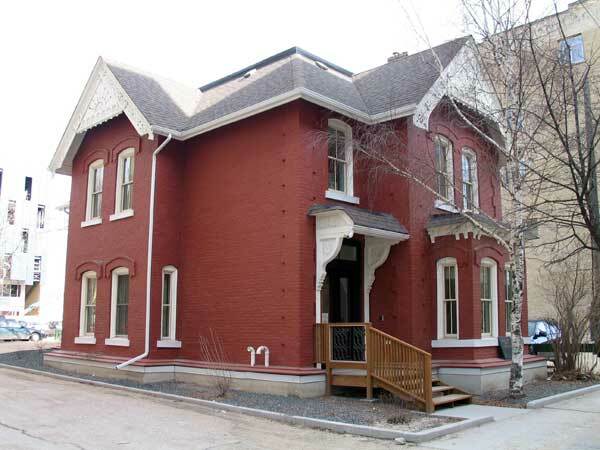 Kelly resided there, alone or with other family members, until 1894 when he moved to 424 Notre Dame Avenue but retained ownership of the building. From 1897 to 1901, it was the home of James H. Cadham. During this time, the residential character of the neighbourhood began to change as the city’s warehouse district expanded to include the area. Eventually, the house would be the only remaining residential structure in the area. In 1908, Thomas Kelly became the home’s sole owner, holding it until the property was seized by the City of Winnipeg due to Kelly’s default on tax payments. The City later sold the property, which went through several changes of ownership until falling vacant. In 2010, the municipally-designated historic site was renovated extensively and became the home of the CancerCare Manitoba Foundation. In 2011, the building was recognized with a Heritage Winnipeg Preservation Award. Kelly House (88 Adelaide Street), Winnipeg Historical Buildings Committee, January 1979.